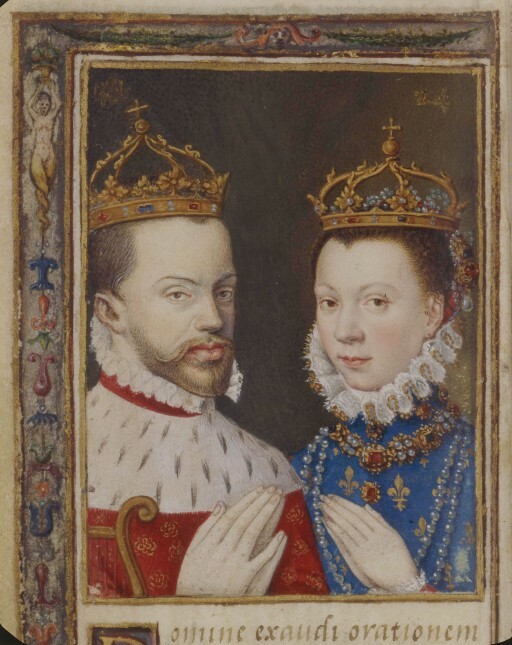 Elizabeth of Valois was married by proxy to King Philip II of Spain at the Louvre on June 22, 1559. After a long and treacherous journey she arrived in Spain and on February 4, 1560, a ceremony of nuptials was performed in a hall of the palace of the of the Mendoza family in Guadalajara. The couple had a honeymoon of a few days in Guadalajara and then began their travels to the Spanish capital. Elizabeth arrived at a small village outside of Toledo on February 14th, resting there in preparation for her state entry. Philip had left her a few days before to oversee the arrangements for the ceremony in person. He went to Madrid first and then came to Toledo with his sister Doña Juana and the duke of Alba. On the evening of her arrival on the outskirts of the city, she received an unexpected visit from her husband who was incognito and attended by his favorite chamberlain Ruy Gomez de Silva, prince of Eboli. Philip informed Elizabeth the preparations for her entry into the city were complete and would begin in the morning. 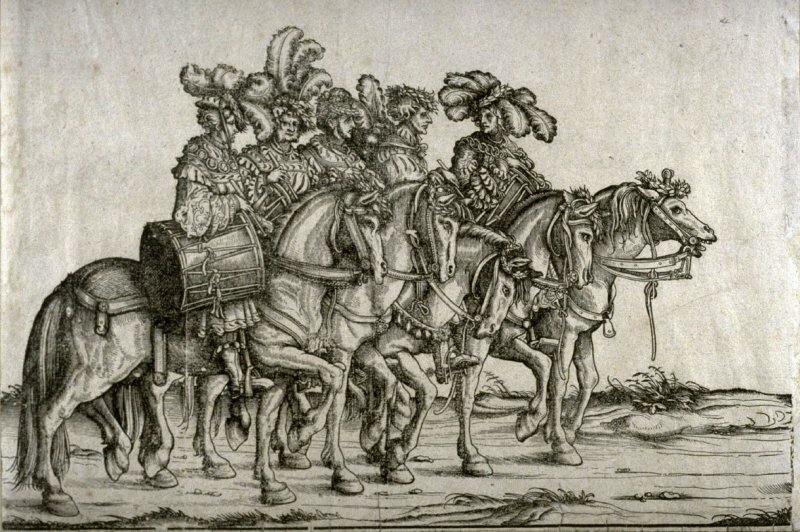 The streets of Toledo had been canopied with arras, velvets, garlands and verdant arches which were decorated with cyphers, love-knots, the lilies of Valois and the shields and eagles of Philip’s father, the Holy Roman Emperor Charles V. The streets were lined with eight battalions of richly dressed infantry. There were three thousand and one hundred cavalry whose saddles were adorned in the Moorish fashion. Half the men were dressed in miparti clothing (garments of two contrasting fabrics, one on each side) and the other half wore the standards and arms of Hungary. When the Queen appeared, the infantry charged valiantly and then formed the vanguard of procession to the Alcazar. Next came maidens of the Sagra, the fertile district of country between Toledo and Aranjuez. Some of these women were presenting the ancient sword-dance of the Spaniards, others were performing dances from other nations to the sounds of kettle drums, dulcimers and tambourines. They were dressed as Gitanas and in Moorish costume. Behind the maidens were members of the Hermandad Cuchillo, the mounted police for the high roads throughout the kingdom preceded by a green banner. They were wearing costumes of green velvet, richly ornamented with gold embroidery, along with cloaks of black velvet. These men were followed by one hundred and thirty-eight officers of the royal mint wearing crimson velvet habits embroidered with gold and bearing banners emblazoned with the royal arms of Spain and the current coinage of the realm. Then came forty members of the hospital de la Piedad, attired in habits of red cloth wearing hats of cerulean blue with fleur de lis in the front and shaped like those of presbyters. They were singing the praises of the queen and thanksgivings for her safe arrival. After this, there was a company of masked men dressed as savages. Following them were the officials of the Holy Office of the Inquisition preceded by their black banner. These men had the royal arms embroidered on the chest of their habits and were mounted on specially chosen horses. Next up were the staff of the University of Toledo followed by eighty canons and dignitaries of the Cathedral all wearing crimson velvet robes and preceded by vergers and mace-bearers. 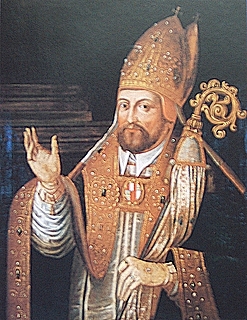 Then came seventy cavaliers from the Order of Calatrava, St. Iago and Alcantera followed by the members of the state council of Castile headed by their president, the marquis de Mondejar. The council of state for Italian affairs followed, led by its president the duke of Francavilla. The officers of the household of the new queen were next and then Elizabeth appeared riding a white palfrey. The horse was caparisoned with the armorial bearings of King Philip’s mother Isabella of Portugal. These markings were composed of cloth of gold copiously embroidered with a network of the most precious gems which glowed with luminous rays of every color of the rainbow. Elizabeth was wearing a robe of jeweled blue damask lined with fur and a ruff of opulent lace sprinkled with gems. She carried in her hand a richly embroidered pocket-handkerchief which was a novelty at the time. Elizabeth entered by the Puerta Visagra where the officers of the city received her under a canopy fringed and embroidered with the initials of “F” (Felipe) and “I” (Isabel). On her right was the cardinal Mendoza and on her left was the duke of Medina de Rioseco, admiral of Castile. Right behind her came an ostensible bodyguard consisting of lords of the great houses of Spain all magnificently garbed and riding superb chargers. Among these men were the dukes of Infantado, Alba, Scalona, Osuna and Brunswick, the marquises of Comares and Aguilar, and the counts of de las Navas, Benevente and Oñate. The procession came to a halt beneath the arched portal of the Visagra which was blocked by a group of cavaliers. According to custom, they barred the entrance of the queen. 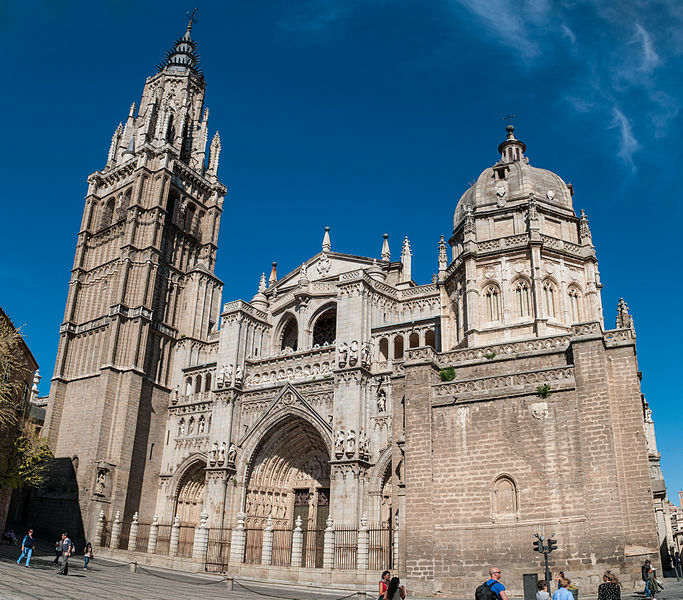 The count of Fuensalida, mayor of Toledo and the constable, the duke of Maqueda, and the conde de Orgaz approached the queen and humbly requested that before entering the city, she swear an oath to respect the privileges of the city. Elizabeth was exceedingly pleased to grant their request. After swearing the oath, the procession proceeded to the cathedral. Elizabeth dismounted before the Puerta del Perdon, entered the cathedral and made her way to the high altar supported by cardinal Mendoza. The queen was met by a procession of ecclesiastics headed by mitered bishops of the imperial see and wearing jeweled copes. Behind them were the dean, the archdeacon and the canons of Toledo. They all advanced toward the queen as the choir chanted the “Te Deum Laudamus” while some of the party swung their censers filling the cathedral with sweet smelling incense. The high altar was covered with precious relics and splendid church plate. In front of the altar, there was a huge silver cross. This was the same cross which had been placed in triumph by the great Mendoza, cardinal of Santa Croce, on the towers of the conquered Alhambra during the reign of Ferdinand and Isabel. Elizabeth knelt before the altar and paid her devotions. Cardinal Mendoza then pronounced the pontifical benediction. The king had witnessed the entire procession from various points of the town and was present during the rites in the cathedral. He disguised himself in a large cloak and a hat with a plume and was attended by Ruy Gomez and another lord of his chamber. Elizabeth left the cathedral and made her way to the Alcazar de Toledo where the royal couple would live for some months. As she made her way to the castle, salutes were fired from the ramparts. The patio, which was lined with a colonnade of granite pillars was adorned with heraldic devices. Before each pillar were massive statues representing mythological personages and heroes of antiquity. At the foot of the grand staircase, Philip’s sister Juana and his son Don Carlos were waiting to receive the queen. Don Carlos had been afflicted for some time with an intermittent fever but he rose from his bed to greet his erstwhile fiancée. Behind them stood Don Juan of Austria, Philip’s half-brother. Don Carlos advanced toward the queen, bent his knee and kissed her hand. Elizabeth graciously received his greeting. For the next several days, Elizabeth received the court and began the management of her household. She seemed to be healthy and in high spirits although some of her ladies remarked that at times she seemed restless and her face was flushed. But they attributed this to the excitement of her journey and all the festivities over the last two months. On Sunday February 20, six days after her grand entry, the French ambassador went to visit Elizabeth. He was admitted to her private apartments on special order of King Philip. He found the queen dancing with her ladies, very happy and in lively spirits. But that night, Elizabeth woke up complaining of thirst and heat. In the morning there were eruptions on the skin of her face and she had a fever and pain in her limbs. Philip came to her side and refused to leave her until the physicians came. When they arrived, they diagnosed her condition as smallpox. She was quite ill for some time but eventually recovered. Today, we might find such opulence over the top, but at a time before international banking, multi-media and modern power-brokering, the displays were powerful political tools. A convincing way to impress foreigners and locals alike was to put on showy events. Appearances meant everything. Foreign dignitaries were expected to bring back detailed reports on every little nuance. Monarchs wanted to know if their gifts were respectfully displayed and appreciated. Under the gaudy shell was real proof that the host nation was a wealthy and powerful, but a reliable ally. Elizabeth’s parents would want to know if she was accorded all the honors due her. Even the tiniest snub would be a slap to her family’s honor. She was, in essence, a living treaty Books of ritual and protocol were assiduously rechecked. If something was left out or shortcut taken, it was duly noted. Additional festivities and embellishments were run past the proper authorities before being inserted into the itinerary. Consequently, each generation tended to try to outdo the previous ones. Not too difficult if the colonies could be milked of precious commodities. Lavish spending meant that the monarchy did not fear becoming destitute. Giving largesse to the masses was to placate them & endear them to their rulers. Generous gifts to church officials and visiting dignitaries, as well as to the monarchs they represented, accomplished the same purposes that provisions, perks, and agreements do on today’s international bargaining tables. Weddings, christenings, funerals and betrothals were the summits, treaties and international trade fairs of today. Royal weddings no longer serve that purpose, so lavishness would indeed need curbing, lest the poplulace put an end to them altogether. But is IS so interesting to read of all the preparations, honors and events of Elizabeth’s wedding. These things actually happened! Oh to be a fly on the wall for the whole shebang! All this makes the more recent royal weddings seem tastefully simple and practical. Very interesting details. Maybe the handkerchief was infected with smallpox.